Mr Parrikar is contesting on a BJP ticket and is pitted against Congress nominee Girish Chodankar and Goa Suraksha Manch's Anand Shirodkar. Manohar Parrikar assumed office as chief minister in March after resigning as defence minister. 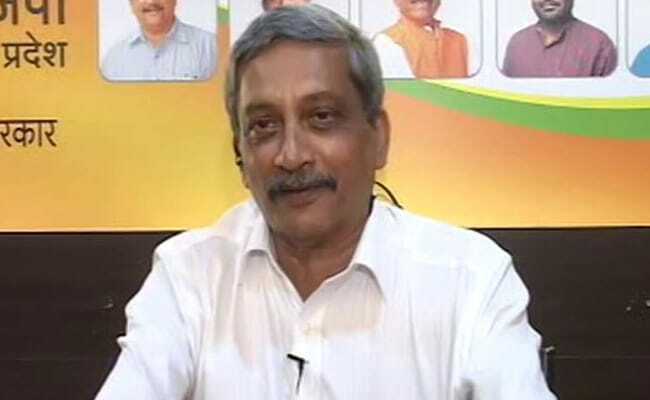 Panaji: The electoral fate of Goa Chief Minister Manohar Parrikar, who contested the assembly by-election from Panaji, will be decided tomorrow when the counting of votes is taken up. Besides Panaji, by-election was also held in Valpoi constituency on August 23. In Valpoi, Health Minister Vishwajit Rane of the BJP is contesting against Roy Naik of the Congress. The counting would be held at the Entertainment Society of Goa complex in Panaji, a senior poll official said. The exercise will begin at 8 am and the results are expected in three hours, he said, adding the postal ballots would be tallied first. Mr Parrikar assumed office in March after resigning as defence minister. When he took charge, he was not an MLA and hence had to get elected to the assembly within six months to continue in the office. His party colleague Siddharth Kuncolienkar, who was elected from Panaji in the February assembly polls, vacated the seat for Mr Parrikar. Mr Rane was elected from Valpoi on a Congress ticket. He later left the party and also quit as MLA. He subsequently joined the BJP which made him a minister. Panaji and Valpoi had recorded 70 per cent and 79.80 per cent voter turnout, respectively.